With the TMS0803 Texas Instruments introduced in the year 1974 the successor of the TMS0102 single-chip calculator design. In opposite to the TMS0102 with the discrete segment- and digit-drivers the TMS0803 needs only external digit-drivers to drive the seven-segment LED display. Due to a flexible design concept with a programmable ROM some design variations appeared. A typical calculator built around the TMS0803 family performs the four basic functions +,-,*, : and adds the %-function. 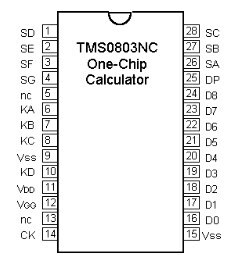 The TMS0803 uses a standard DIP-28 package. 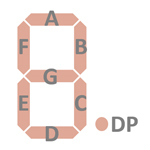 The Segment drivers A-G and the Decimal point are connected to a display in the pictured way. The keyboards of all calculators based on the TMS0803 family consist of a x/y-matrix connected to nine digit-driver outputs and the keymatrix inputs KA and KD. Calculators based on the TMS0803 make use of a 9-digit LED-display with common cathode architecture. If you have additions to the above datasheet please email: joerg@datamath.org. © Joerg Woerner, February 02, 2001. No reprints without written permission.